On Friday, May 23rd , OHIONET graciously hosted the 20th Annual CMCIG Spring Workshop, Virtual Education Collections: Issues and Best Practices. 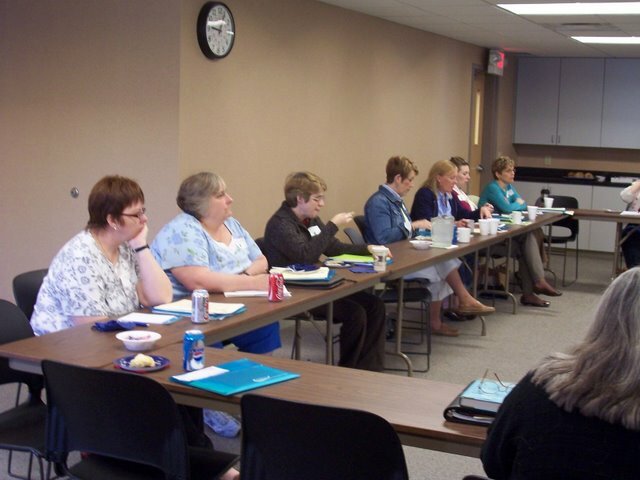 Twenty-six individuals attended, including four K-12 library media specialists. In her session, “Best Practices for Developing a Digital Collection”, Anne Gilliland, OhioLINK emerita, shared information on and challenges of acquiring, cataloging, circulating, and maintaining electronic resources gleaned from her fifteen years of OhioLINK service. She also offered insights about future OhioLINK acquisitions. Cynthia DuChane, INFOhio Project Coordinator, discussed the collaborative P-16 transition project between INFOhio and OhioLINK, and Mary Conroy, OHIONET’s Electronic Resources Coordinator, provided a brief history of OHIONET and highlighted some of their continuing education workshops, library and technical support services, and future database acquisitions. During her very lively “Children’s Literature Online” session, Mary Cummings, Shawnee State University, shared her research on “children’s literature that lives on the web”. Mary demonstrated commercial multimedia resources (TumbleBooks, BookFlix), free multimedia resources (Starfall, Storyline Online, Storybook Web), text only free resources (Children’s Books Online, International Children’s Digital Library, Literature for Children), and free podcasts and other audio files (Light Up Your Brain, iTunes and iTunesU). Ann Raney, University of Dayton & CMCIG co-chair, asked members to check their CMC’s links on the interest group’s universities’ web page list (http://www.alaoweb.org/igs/cmcig/ohiocmc.php) and send corrections to Ann.Raney@notes.udayton.edu . If you have other CMCIG web page changes and corrections, send them to Ann. Greg Martin, Cedarville University & CMCIG co-chair, updated members on the CMCIG’s online CMC Directory project (http://cmc.library.uakron.edu/cmc/index.html ). Following a discussion of other available directories, the group voted to revise the current database. Greg will work with the ALAO webmasters to design an updated “Ohio CMC Directory”. When the site becomes available, the CMCIG coordinating committee will contact Ohio CMC staff and encourage them to enter their data. You may send comments about or suggestions for the revised directory to marting@cedarville.edu . The group chose A. Carolyn Sanders, Central State University, as the 2008-2009 CMCIG co-chair, and Kathy Yoder, Bowling Green State University, as the CMCIG co-chair elect. Diane Schrecker of Ashland University, agreed to host the 2009 spring workshop. Additional information about the CMCIG projects, listserv, and blog is available on the CMCIG web page (http://www.alaoweb.org/igs/cmcig/index.php). This entry was posted in Vol. 26 no. 2 (Jun. 2008) and tagged Interest Group/Committee News. Bookmark the permalink.